Going back at least as far as the Tim Flannery era of the San Diego Padres I’ve been a fan of the kind of player who isn’t the vaunted five-tool prospect but the guy who just finds a way to get the job done. This is the guy who owes his career not so much to exceptional talent (though to make it to pro ball at any level, you must have some special gifts), but to his willingness to work hard, make things happen and play within the game. These are the guys that give full effort and attention on every pitch with one single goal: help their team win. Flannery, for example, was an artist when it came to getting hit by a pitch. If a pitcher was going to try to get one past Flannery low and inside, the pitch was going to hit Flan’s thigh — each and every time. Flannery often led the league in getting hit by pitches, a title usually reserved for four-spot hitters. In that spirit, let me introduce you to Vance Albitz. 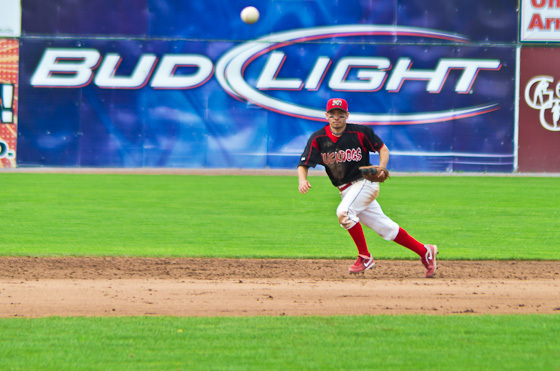 Albitz played only 12 games for the Batavia Muckdogs this season. His contract was purchased from the Lincoln Saltdogs (an independent team) late in the season after injuries depleted the St. Louis Cardinals farm system of low-level shortstops. Albitz was hitting .315 at Lincoln and impressing the hell out of the fans there with his defensive play. Originally from Torrence, Calif., Albitz was a star in high school, but not highly recruited by college scouts. He wound up at UC San Diego, a university better known for its science and technology prowess than its sports programs. Albitz helped lead Tritons to a birth in College World Series play and was twice named that nation’s top defensive shortstop. Undrafted in June 2010, the 5-8, 160 lbs Albitz signed with the Lincoln team and placed on a roster of mostly last-chance minor leaguers who were fighting just to stay in the game rather than just win games. Each new player was a threat to take your job away. For good. It wasn’t until his third week on the team that he got a chance to start. As luck would have it, he caught some bug the same day. Albitz wasn’t about to beg out of his first professional starting opportunity. He suffered through a miserable night and morning in the hotel, barely able to put anything in his stomach. Come game time, Vance took medicine to mask the symptoms and ran out to third base. After the game, it started all over again, but even worse. The shivers, the night sweats. For seven days, from Wichita to Sioux City, Albitz suffered and played silently. He batted .270 during the stretch and made only one error in the field, but his body was in full rebellion. Vance lost weight, couldn’t keep any food down, couldn’t do anything but be sick, then take medicine and play baseball, then be sick some more. “It wasn’t like we were at home, where I could have just walked in to see the team doctor. We were in hotels. Plus, I was finally playing. He got a hit in five of the seven games on the road trip. In his final game in Sioux City, Vance knocked in his first (and only) run of the season. Then there was nothing left. That tells you something about the kind of heart Albitz has, a love for the game that is a throw back to the baggy plus fours and loose fitting double knits Albitz favors on the field. The statistical record is incomplete, but it doesn’t look like Vance is a Moneyball player. His OPS with Batavia was only .744 and in 2010 at Lincoln it was .610, though at UCSD in 2009, it was a more impressive .956. It’s a long, long way from short season Class A ball to the majors, and a position player wearing number 56 is never considered a prospect, but here’s to hoping the St. Louis Cardinals give Albitz every chance to see how far he can go, maybe even a return to Batavia in 2012. This entry was posted in Uncategorized and tagged baseball, batavia muckdogs, Sports by Howard Owens. Bookmark the permalink. I’ve become a Vance Albitz fan as well. Last night, in a 20 inning game in Springfield (AA), he pitched three scoreless innings, including a pair of strikeouts. If that wasn’t enough, he somehow got to Memphis (AAA) the following morning and played in an afternoon game there. Yeah, I am totally with you – rooting for the guys that play beyond their statistical measures.